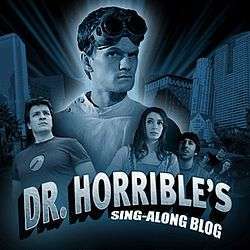 Dr. Horrible's Sing-Along Blog is the soundtrack to the 2008 web series of the same name. It was released exclusively through the iTunes Store on the evening of September 1, 2008, with lyrics and liner notes appearing on the series' website the next day. On the first full day of its release, it was the most downloaded album on iTunes in both Canada and Australia, and reached #2 in the U.S. On September 10, 2008, Dr. Horrible's Sing-Along Blog debuted at #39 on the Billboard 200 despite being an iTunes exclusive. The soundtrack was released on CD on December 15, 2008, exclusive to Amazon US. ↑ "Lyrics and liner notes coming soon on our site. For now, let your ears enjoy the soundtrack on iTunes.". Dr. Horrible Twitter. Retrieved 2008-09-02. ↑ "Drhorrible.com for lyrics and liner notes!". Dr. Horrible Twitter. Retrieved 2008-09-02. ↑ "Dr Horrible Soundtrack a Big Hit". Dr. Horrible's Sing-Along Blog Official Fan Site. Archived from the original on September 12, 2008. Retrieved October 16, 2011. ↑ "Young Jeezy Nets Second Album Chart-Topper". Billboard. Retrieved 2008-09-18. ↑ Bang, Bif. "Dr. Horrible's Sing-Along Blog: Joss Whedon, Neil Patrick Harris, Felicia Day, Nathan Fillion: Music". Amazon.com. Retrieved 2012-02-14.